All of the groups have arrived here in Seattle! All of the participants showed up on site at Rock of Hope Baptist Church with smiles on their faces ready to serve churches in this city. 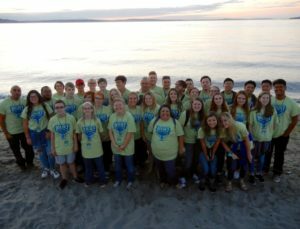 This evening we visited two locations in Seattle in an outing called the “City Experience.” We went to Alki Beach where we observed stunning views of the Puget Sound and Kerry Park which had a panoramic view of the Seattle skyline. We took the group picture on the beach and prayed in both locations. This is an incredibly beautiful city with an overwhelming amount of lost people. Please pray that people of Seattle would see the beauty of nature for what it truly is: God’s amazing creation. This year’s theme comes from 1 Thessalonians 2:8, regarding living, loving, and speaking boldly. All three of these elements of boldness will be needed this week in this incredibly lost city. Pray for the students and staff as we do our best to serve the church and shine the light of Christ in this area. The number of unsaved people may seem overwhelming, but anything is possible with God. Be sure to send E-couragrams to the participants and check back throughout the week for more updates, pictures, and videos!